In addition to being an expert garage door contractor, our company is an excellent gate service provider. Garage Door Repair Lincolnshire has a plan, a tight timeframe for every technician, the perfect infrastructure and the ambition to keep improving in accordance with modern demands. These are great qualities for a company that doesn't offer only garage door services but additionally gate repairs, too. We like to embrace all domains of your needs whether you want garage door replacement or gate intercom installation. For this reason, our efforts are daily and never stop just like our training and progress. We are a high tech company and move forward hand in hand with technology and with respect to people's requests. This way, we manage to be ready every time you call for same day or an emergency service. As experts in all residential gate openers, we are also knowledgeable of the latest remotes and have the expertise to repair problems or replace them. We are here to program them or help you find a new gate clicker replacement. 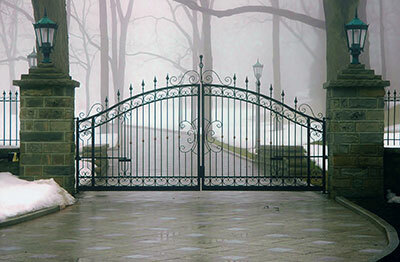 Swing gates are often supported only by hinges, which might age, have welding problems or rust. When the problem is irreparable, we proceed with the replacement of the hinges. In any other case, we just tighten them or proceed with hinge welding repair to ensure good adjustment and, thus, movement. We install a new phone entry system and are familiar with all well-known brands. We are also knowledgeable of different models, which are used for different applications since each property and every family would have different demands. We program intercom systems properly and also show you exactly how they work. The daily use of the opener might exhaust the dynamics of motors and in many occasions, we have to proceed with gate motor replacement. In a different case and when the existing opener complies with all safety regulations, we will maintain it by checking each part and making sure the gate moves automatically and safely.